A significant consequence of climate change is the direct and indirect effects on both wildlife and human health. Warmer temperatures can lead to increased range of pathogens and disease vectors, leading to higher infection rates in both animals and people. Or the impacts can be more complex. Increasing global temperatures change how ecosystems function, leading to changes in prey availability or quality for wildlife populations and change in food security and safety for humans. Beluga whales in the Beaufort Sea primarily forage on Arctic Cod, a fish species associated with sea ice. If sea ice loss accelerates and the patterns of sea ice shift, so may the belugas’ access to their main prey. This could lead to changes in the health and condition of the whales, and possibly affect subsistence harvest opportunities. Working with communities to monitor beluga health will help detect any changes that may be significant for beluga populations or the communities that rely on them. This is important as access to safe traditional foods which is critical to the public health of Northern Indigenous people. 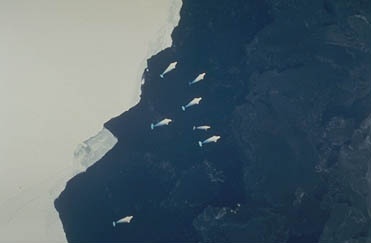 The Canadian Wildlife Health Cooperative – Québec Region is collaborating with Fisheries and Oceans Canada, the Tuktoyaktuk Hunters and Trappers Committee, the Fisheries Joint Management Committee, and the University of Saskatchewan to investigate the health of belugas in the Beaufort Sea. Health assessments of beluga whales harvested as part of subsistence hunting by Inuvialuit communities includes sampling for contaminants, diet studies and overall animal health. This will provide an indication of the condition of the beluga population and also helps communities to identify and address food safety issues related to the consumption of mipku (dried meat) and muktuk (skin and blubber). During the summer of 2015, a total of 21 harvested whales were examined by veterinary pathologists. Overall, the animals examined appeared to be in very good health even if the body condition of some of these beluga was sub-optimal. Contributing to over 3 decades of monitoring of beluga whales in the region, the CWHC will continue this work in the summer of 2016.